Most of you must be familiar with Naan - the thick fluffy Indian bread that is sooooooo delicious. Well, Naan actually has its origins in Persia and this type of bread is very commonly made and consumed in Central Asia. 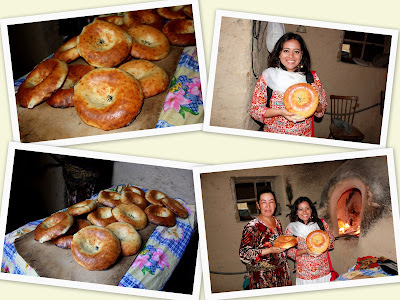 In Uzbekistan, the bread is known as Non or Lepyoshka. There are varieties of Lepyoshka where in Khiva it is normally flaky, in Bukhara it is sprinkled with sesame seeds and in Samarkand, it is glossier and smaller and thicker. 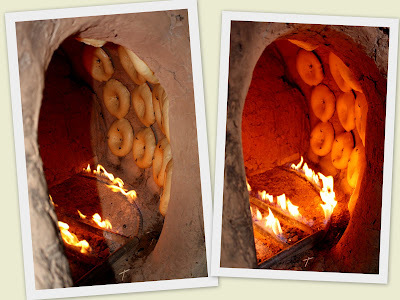 The bread is baked in a tandir (similar to tandoor) and is an important part of Uzbek cuisine. 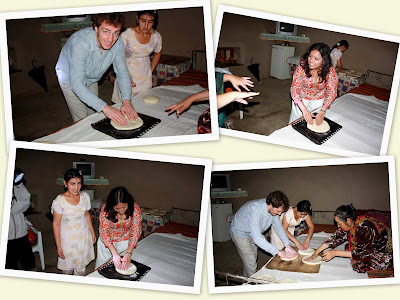 Having read about the Lepyoshka before the trip and as a Naan lover, I was very keen on tasting the bread and watching how it was made. 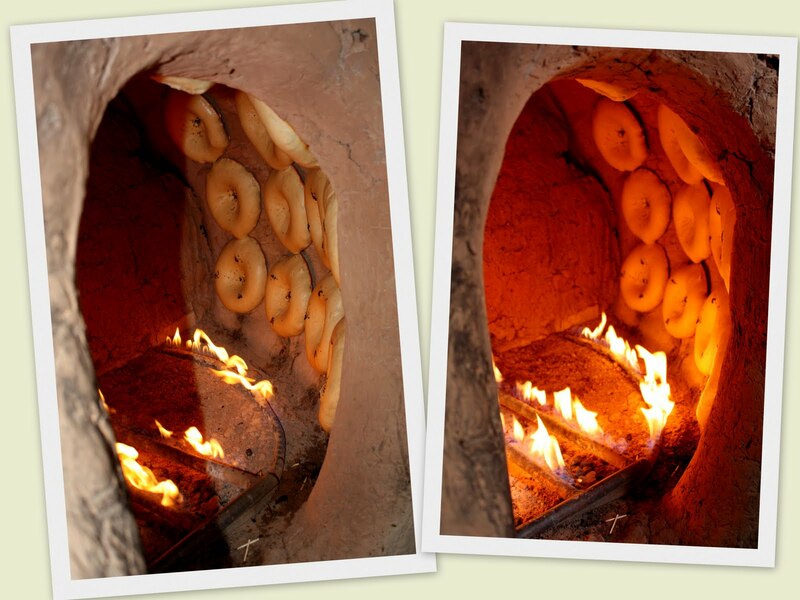 Our driver, Usman, was kind enough to bring us to his neighbor's place in Samarkand to watch all the bread action. The family consisted of five people but only three were there as the father and older son were living and working in Russia. The mother, daughter and younger son were the ones managing the whole bread baking business and it was really fun to watch and participate. These people wake up at 4am everyday to bake the bread and bring it to different markets in Samarkand to sell. 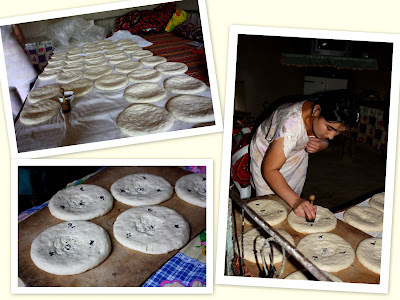 The night before, they prepare the dough so that it raises overnight and then in the morning, they flatten it and bake it in the tandir. So, when we were there at 8am, they had already baked a few batches and the dough was prepared. All the lepyoshas were laid out on a long table in batches and the daughter stamped the middle portion of each bread with a floral design. then, sesame seeds were added on top. We then went to the tandir outside the house and the son and mother started to fling the bread into the oven. It was amazing how they stuck on! We left them to bake for 40 minutes and were served tea and chocolates during this time. Finally, the moment we had all been waiting for! The lepyoshkas were ready! Look at how delicious they look! And that's me posing with my very own lepyoshka! The bread was heavenly...mmmm nice and warm and it was perfect for a rainy day. I really admired the family. Many times, they don't have electricity in the house but still, they work very hard to produce at least 500 lepyoshkas a day. They work day and night and explained that that is their way of making money. The mother too was very affectionate with us and kept referring to me as her daughter too! It was indeed a very special experience and I loved my time with this family.